Bass often feed on small crustacean species in muddy water. However in muddy water you need a strong vibration to attract bass, still they are feeding on very small bait similar to a 2 inch soft plastic, so you decide to use a small hard body but then you need lighter line and when fishing in cover you can't afford to lose line strength... What to do? Situations like this are quite common and is one of the reasons why lately many anglers use slow bait tactics such as small soft baits on wacky rigs. However there is another option, FEINT BAITS. FEINT BAITS allow the angler to use a large lure retrieved fast on strong line but still maintain a small silhouette This means improved catch rates and more fish in the boat. KUWASE SHAD dives with a high pitch tight wobble and strong vibration with a start-stop retrieve pattern. When fish are inactive KUWASE SHAD can also be used slow rolled over structure. Designed for irregular action on contact with structure it can be traced tightly across a variety of different materials. D58SP is also fitted with the OMEGA BILL for improved evasion ability for less snagging on structure. 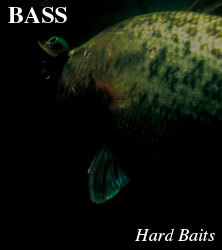 FEINT BAITS SERIES - What's FEINT BAITS ?